Stephen Curry and Kevin Durant each scored 32 points but the Dubs struggled in the fourth quarter of a 129-107 loss in Portland on Wednesday. The Warriors suffered a 129-107 loss to the Trail Blazers on Wednesday, and the Dubs enter the All-Star break riding a defeat in Portland for the second straight year. The game went back and forth for the first three quarters, but Portland seized control in the fourth quarter as the Dubs ran out of gas, putting an end to their five-game winning streak. Despite the loss, the Dubs head into the All-Star Break with a Western Conference leading record of 41-16. Stephen Curry and Kevin Durant led the way for the Dubs with 32 points apiece on a night in which the team was without DeMarcus Cousins, Andre Iguodala and Shaun Livingston. The game featured 17 lead changes through the first three quarters, but Portland dominated the fourth, outscoring the Dubs 35-12. Durant started the game strong, scoring 16 points in the opening quarter. He’d end up shooting 12-for-17 on the night, including 3-for-4 on 3-pointers. 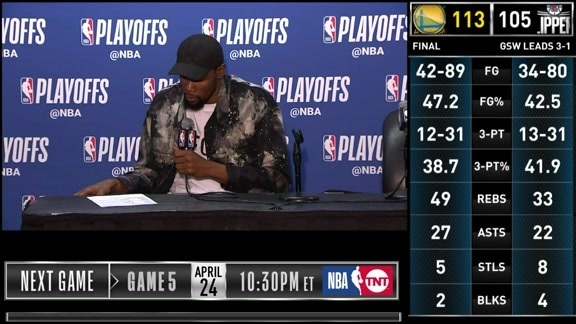 As impressive as that is, it’s not exactly anything new, as Durant has shot 62-for-97 (63.9 percent) over the last six games heading into the break. Curry knocked down four 3-pointers in the third quarter and combined with Durant to score 30 of the team’s 34 points in the period. The Dubs would lead by as many as five in the quarter, but the lead wouldn’t last. Portland rallied behind stellar play from their bench, as Trail Blazers reserves outscored those of the Dubs 52-23. Damian Lillard led the Trail Blazers with 29 points and reserve big man Jake Layman torched the Dubs for 17 points on 7-of-9 shooting. Golden State heads into the All-Star break with a mark of 41-16 (.719) including a record of 19-9 (.679) on the road … The Warriors have won 16 of their last 18 games overall and own the best record in the Western Conference. The loss snaps the Warriors 11-game road winning streak, the third longest in franchise history. 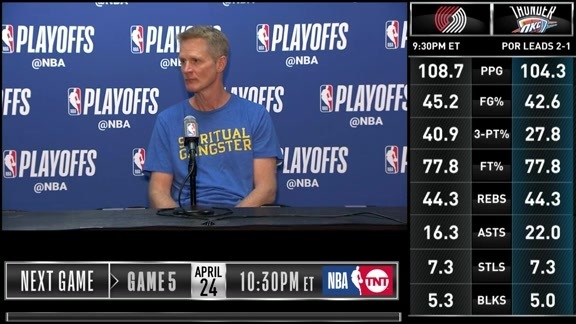 The Warriors and Trail Blazers concluded the season-series tonight with each team winning two games … The Warriors have tied or won the season-series with the Trail Blazers in six of the last seven seasons. Golden State committed nine turnovers tonight, marking the first time this season the Warriors have committed less than 10 turnovers in consecutive games (season-low tying 7 vs. Utah, 2/12) … The last time the Warriors had fewer than 10 turnovers in consecutive games was Feb. 13-15, 2017 … Golden State is 11-1 this season which committing 10-or-fewer turnovers. 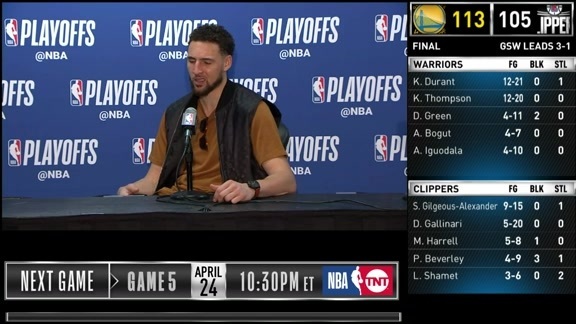 Golden State completed their eighth back-to-back set of the year this evening … The Warriors have split three series, swept four and been swept once … They are 6-2 in the second game of back-to-backs this season. The Warriors had 10 blocks tonight, marking the fifth time this season the team has recorded 10-or-more blocks. Golden State has scored 100-or-more points in 28 consecutive games, its longest such streak since 36-straight games of 100-or-more points from December 11, 2016 to February 28, 2017. 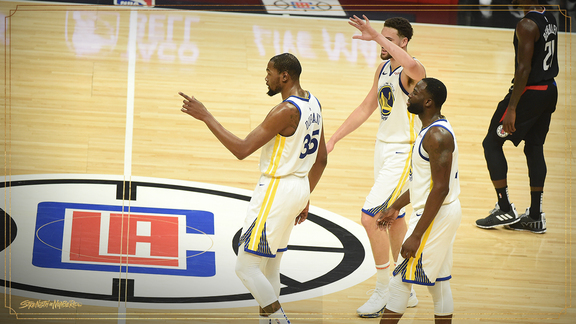 Tonight marked the 18th time the Warriors have used the starting lineup of Stephen Curry, Klay Thompson, Kevin Durant, Draymond Green and Kevon Looney … Golden State is 12-6 (.667) in those games this season. The Warriors have played 57 games thus far, the third most in franchise history prior to the All-Star break … In 1950-51 the Warriors played in 59 games prior to the break and they played 58 during the 2017-18 season. Kevin Durant scored a game-high tying 32 points on 9-of-14 shooting from inside the arc … Over his last six games, Durant is shooting 73.6 percent from the field (53-of-72) … Durant has scored 30-or-more points in two of the last three games and 19 times overall this season. Stephen Curry also scored a game-high tying 32 points … It was his 38th game this season with 30-or-more points. It was the 8th time this season both Curry and Durant have score 30-or-more points in the same game … The Warriors are 6-2 those games (8-2 all-time). Klay Thompson handed out a career-high tying eight assists (four times, last, 2/1/17 vs. Charlotte). Draymond Green recorded seven assists and three turnovers tonight … Since January 1, the forward has recorded 148 assists to 37 turnovers.